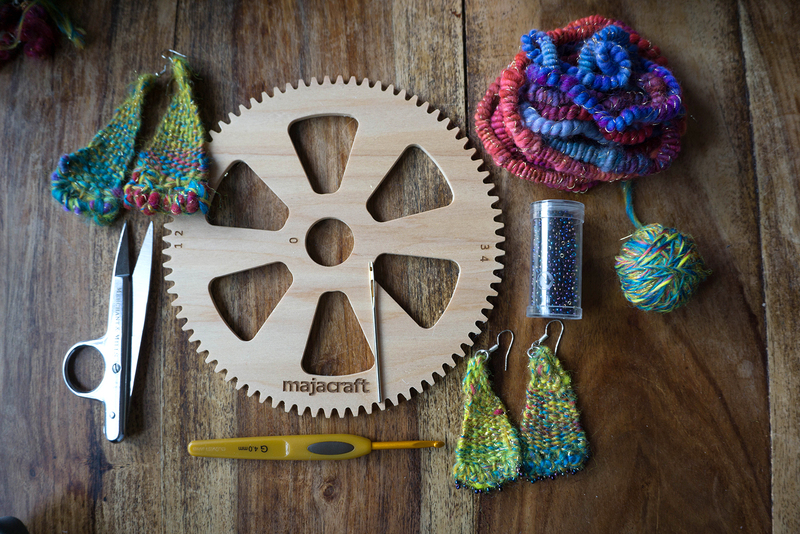 Home » Events » Circle Weaving Majacraft Loom Giveaway! Here we are today with a special announcement! Hopefully you already know about the Circle loom and the Circle Weaving group we (Andrew Poad of Majacraft and I) set up on Facebook, its a really great community of creative people doing the most creative things! We made the group because, once the Circle Looms were made and we started using them, it quickly became obvious that there are way more possibilities for their use, and what can be made with them than we had even originally anticipated. If you haven’t seen it yet check out what everyone has been doing in the group, you will be amazed too! And one of the nicest things is the spirit of helpfulness and cooperation you will find there too, you can learn lots, and the sharing of tips and techniques is very open and inclusive, I am really enjoying being a part of that. So today we are announcing the winners of the ‘Warp Speed’ competition we have been running in the group. There are four Majacraft Mini Looms to be drawn! Warp Speed is a booklet that Andy and I put together with our new system for pattern making and warping instructions for the circular looms. We included a number of different patterns for people try out, and a template for making your own. You can get your copy of it from the Majacraft Website if you havent found it yet! We are also announcing ONE MORE winner, someone who is watching the broadcast live (check the YouTube link below to get the countdown! ), someone who has left a COMMENT ON THIS POST! Just say hi, thats all we need 🙂 The draw will be made live on Air today!! If you want to jump in and join the circular excitement, this could be just the thing to get you going, this extra draw is open to everyone, although we would love it if you join the Circle Weave Facebook group too of course! Comment below then watch the broadcast live on YouTube and see if you are a winner too! Yes, I am going to watch, Suzy! would love this loom, really want to make the ear rings have the beads already. I’ll take my chances! Can’t wait to do another circle weaving! What a spur to creativity! Would love one. Love this art! Can’t wait to see the video. I would so love to have a circle loom!! This is something I want/need to learn! I am just learning circle weaving. I can not afford to buy a loom right now so I am using my grand daughters nifty knitter loom to practice. OMG OMG OMG! I love this. I have a few bicycle spokes here that I want to weave in, but a loom like this would be OMG!! !